Like all professions, being a child clinical psychologist has its share of the good, the bad, and the ugly. Overall, the good greatly outweighs the rest. In the past week or two, this has been particularly true. As someone who primarily does psychological assessment, part of the news I deliver to parents is diagnostic. I give their children labels and sometimes multiple labels. Most of us don’t like hearing that there’s something wrong with our children. Occasionally, parents get mad at me for this but more often than not, my message is greeted with GRATITUDE. Part of this has to do with what life has been like for the child at school and at home prior to the assessment. It has been hard or they would not be seeing me. Some of the kids I see have been kicked out of preschools and kindergartens. I saw a teen last week who’d been kicked out of daycare (as an INFANT), preschool, and ballet class, all before she started kindergarten. I see kids who work five hours a night on homework and their report cards are littered with teacher comments such as “needs to put in more effort”. I see parents who are so stressed out that they are barely able to hold back the tears in front of their children. Sometimes, I receive gratitude from my patients, themselves. I don’t discuss diagnoses per se with my younger patients. They have to be old enough to understand it at a rudimentary level. They also have to be old enough to understand privacy and the risk of disclosing a diagnosis of ADHD or learning disability to others. Some people will be supportive, others will not. I do discuss testing results with older teens in detail and include diagnostic information. To teens who have been struggling for years with untreated ADHD and learning disability, been told that they are lazy, have told themselves that they are lazy and dumb, my giving them a different explanation of their challenges can be of great relief. As I have written in the past, it is a poignant moment when I tell a previously stoic looking teen boy that I know he is a hard worker, I know he’s not stupid, and the tears of relief roll freely down his cheeks. But to define problems is not enough. People need a plan! I often say that the most important part of my assessment reports is the recommendations section. Out of a 6-9 page report, it is usually 3/4-1 page long. I have seen much shorter sections written by other psychologists and others that are so long and non-specific that they look like they’ve simply been pasted from another document without any editing according to the individual needs of the patient. I go over the report with parents and make sure that we discuss the recommendations. If I have a particularly high number, I make recommendations about prioritizing them and sequencing them over time. Finally, to make sure that parents leave with something concrete in addition to the report, I send them off with a packet of educational materials that I have selected just for them. 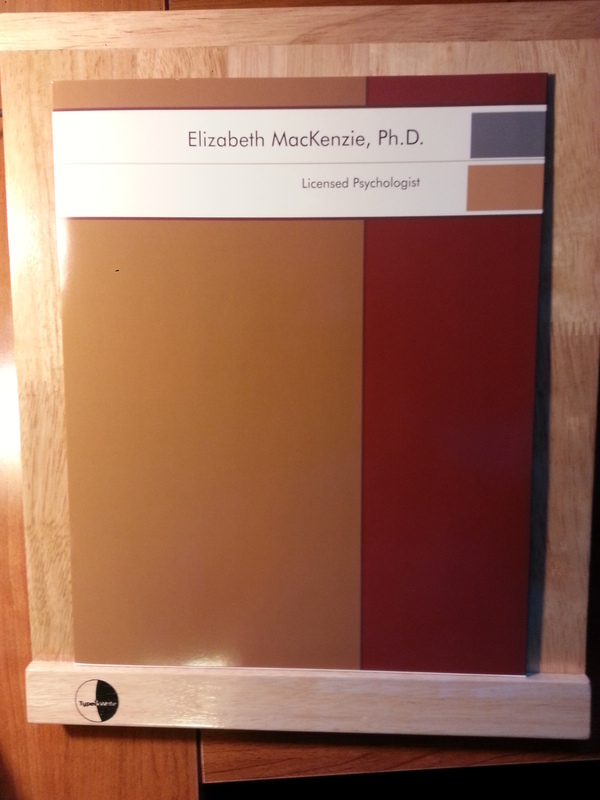 And I put all of the materials in a pretty folder with my name on the front and my contact information on the back. This makes it less likely that the pieces get lost or that the nature of the contents of the folder is forgotten. Last week I met with a mom of a delightful 7 year-old girl to go over testing results. Part of the results were plainly positive; this girl was a lot smarter than she seemed and much smarter than most. But I also gave multiple diagnoses. At the end of the session, the mom asked, “How many of these assessments do you do in a year?” I told her that I’m working part time this year but in the past that it was about 100-110. She said, “Think of all of those children you have helped! And you have helped my child already!” She left giving me a very big smile and a warm handshake. Thanks to all of you for your trust. Thank you for letting me into the most delicate and vulnerable places in your lives, your minds, and your hearts, in order to help when the only guarantee I can provide is that I will try my very best. I told you it was a pretty folder! Making a difference in someone’s life is what matters. You do this in many ways, my friend. You have a true gift for helping these children and their families. This post is a good reminder that people’s struggles are often hidden and we shouldn’t make assumptions. Thank you and yes indeed, many struggles are hidden. You do a wonderful thing Elizabeth, helping others, especially the youngster is such a huge gift. For them and their parents. Thank you so very much, Tracy. I agree with Tracy. You have been given a gift. I am very happy that you use it to help others.